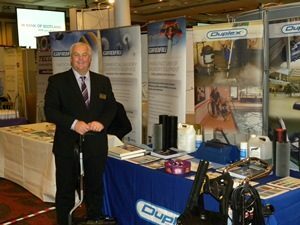 Our picture shows Duplex’s Mike Conroy supporting the Scottish Care Conference and Exhibition at The Hilton Hotel in Glasgow where he exhibited machines from the Duplex range of floor and steam cleaning machines. Over 300 delegates attended this excellent conference and exhibition with many commenting on the outstanding organisation, great venue, catering and quality guest speakers. We look forward to next year’s event.